As the Trump administration and Congress continue to drive the country toward an unnecessary and chaotic government shutdown, there appears to be substantial confusion about whether Deferred Action for Childhood Arrivals (DACA) recipients are already losing their protections or if Congress has until March 5, or later, to address the issue. The answer to this question is important, as well as simple: Dreamers are losing protections now, and many more are losing their DACA status each day that Congress refuses to act. That’s why bipartisan groups in both the House and the Senate are pushing right now for legislation to provide permanent protections to Dreamers and address various other aspects of the U.S. immigration system, including border security. On September 5, 2017, the Trump administration ended DACA. 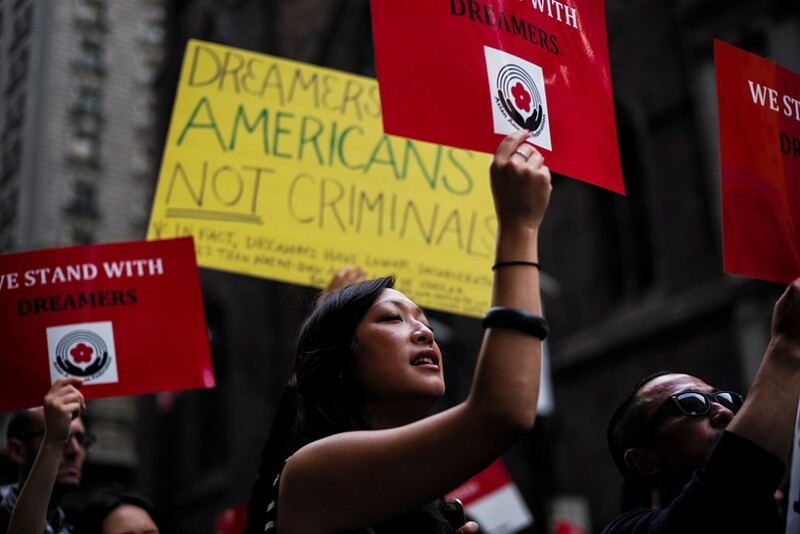 The Department of Homeland Security (DHS) rescinded the memorandum that created DACA, stopped granting DACA to new applicants, and gave certain current DACA recipients a small window of time to apply for a final two-year extension. According to DHS statistics, 22,000 DACA recipients whose status was set to expire between September 5 and March 5 failed to meet the 30-day deadline set by the administration—a deadline that the administration refused to extend even for DACA recipients living in areas devastated by Hurricane Harvey and Hurricane Irma. As a result, nearly 17,000 young people are estimated to have already lost DACA protections. Every day that passes, an average of 122 additional DACA recipients lose protection. Moreover, the Migration Policy Institute estimates that by March 5, 2018, approximately 23,000 children who are turning 15 and would have become eligible to apply for DACA will instead remain vulnerable to detention and deportation. Finally, hundreds of thousands of Dreamers and their family members—including hundreds of thousands of U.S.-citizen children—continue to live with fear and uncertainty about their future in this country. One source of confusion around whether any DACA recipients will lose protection between now and March is a preliminary injunction issued last week by a federal district court ordering DHS to allow DACA recipients to once more apply for renewals. Last Saturday, U.S. Citizenship and Immigration Services announced that it will begin accepting renewal applications again. Testifying before the Senate Judiciary Committee this week, Homeland Security Secretary Kirstjen Nielsen told Sen. Amy Klobuchar (D-MN) that “no one will lose their status until [M]arch 5 or later, depending on what happens with the court.” After Sen. Mazie Hirono (D-HI) challenged Nielsen on that claim and asked her to address the—at that point—approximately 15,000 DACA recipients who had already lost protection, the secretary responded, “I am not familiar with 15,000 who have lost their status. As I understand it, the program ends March 5.” Some congressional Republicans, including Senate Majority Leader Mitch McConnell (R-KY) and Sen. John Cornyn (R-TX), have similarly argued that the DACA deadline is, at the earliest, March. Importantly, nothing magical happened as a result of the court order. The nearly 17,000 people that have already lost DACA since September have not had their protections restored, and they remain at risk of detention and deportation and unable to work lawfully. The same is true for the 122 people that lost their protections yesterday, the 122 that will lose their protections today, and the 122 that will see their protections expire every day thereafter until March 5. These people will only regain protection under DACA when they collect their paperwork and the filing fee, apply to U.S. Citizenship and Immigration Services, and most importantly, have their applications adjudicated. Under the best circumstances, it could take substantial time for the administration to process these renewal applications. But there is little reason to believe that the same administration that ended DACA will act swiftly to adjudicate applications and restore protections—especially when the Justice Department just requested that the U.S. Supreme Court overturn the lower court ruling, taking the highly unusual step of bypassing the U.S. Court of Appeals. The reason Democrats and Republicans in Congress—and allies throughout the country—are urging Congress to pass legislation now is that the crisis caused by the elimination of DACA is already upon us. If Congress were to pass a fourth short-term spending bill that funds the government through February 16—a bill that is so unpopular that it appears unlikely to garner the support of a majority of U.S. senators—more than 3,400 current DACA recipients would likely lose protection before Congress was once more brought back to the table to discuss whether to take up bipartisan legislation to protect Dreamers. Instead, Congress can and should pass legislation such as the Dream Act immediately, and not let another Dreamer lose their protection. Tom Jawetz is the vice president for Immigration Policy at the Center for American Progress.